In a word, no. But there are options. 1. How hot do you want/expect to look? 2. What shape is your head? 3. What kind of riding do you do? 4. Do you “need” it to match your bike? 5. Do you have some sort of crazy rig? 6. With anodised gold rims? 7. Or are you just trying to prevent brain injury? 9. What’s your reasonable budget? 11. If not, are you prepared to cross the Yarra? In the mean time, I’ll go to sleep then put my thinking helmet on tomorrow and get back to you. 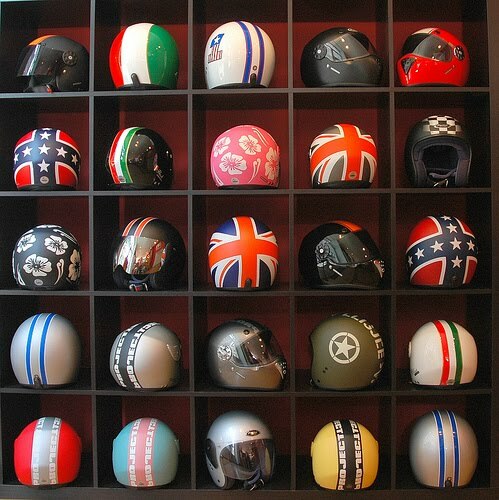 None of these are actually 100% my style, but – at the same time – I hold a particular envy of motorcycle helmet choice.